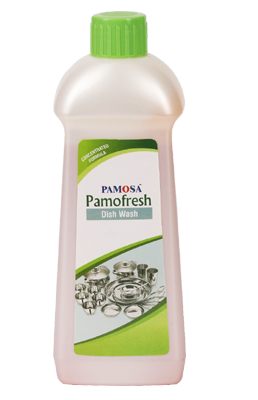 PAMOSA Homecare dish washing Liquid is easy to use as it cuts through the grease on dirty dishes without polluting the environment. The high quality cleaning ingredients cuts through grease and stains, leaving dishes, glasses, cutlery, as well as pots and pans, sparkling clean without leaving any harmful residue. Powerful - the unique detergent system cuts through grease & stains, leaving dishes sparkling clean. Leaves dishes hygienically washed- no harmful residue. Economical - concentrated formula can be diluted for cleaning. Made with fragrant mild ingredients safe and gentle to the skin. 1. For tough grease, pour few drops of PAMOSA dish washing liquid on a wet scrub sponge & apply on the utensil. Later wash dishes then rinse with water. 2. For regular cleaning, dilute few drops of PAMOSA dish washing liquid in a bowl of water. Dip the scrub-sponge in the solution, wash dishes then rinse with water.